The secret of aging well is exercise and eating right, as everyone knows. Right? Right! Additionally, socialization with others, especially family, is an equally important component to a long, happy life. As we approach the season where we celebrate the most important aged people in our lives, our parents, we must realize that cards, flowers, or phone calls cannot measure or even compare to the gift of our time. Loneliness takes a toll on our seniors. In a June 18, 2012 study by the University of California, San Francisco (USFC), it was found that people (60+) who report feeling lonely, have a 45% increased risk for death. Isolated individuals have nearly a 60% increased risk of both mental and physical decline than those who are more social. (1) These statistics are pretty dismal, don’t you think? Quite often, elder adults live with loneliness and become isolated, because they reject socialization invitations. What a great opportunity to visit with them than on Mother’s and/or Father’s Day! Who needs an invite? Due to the mobility of our society, many families find that their adult children move away for education or employment opportunities. This factor, in and of itself, causes people to not be able to visit as much as previous generations. As our elder loved ones age, they are doing so without immediate family living near to care for them. Capitalize on the opportunity to coordinate a reunion of the kids, grandkids, aunts, uncles, cousins, etc. Have a BBQ to share a meal and enjoy one another’s company! How long has it been since your enjoyed Aunt Alice’s Chocolate Pie or playing Pinochle with Uncle Rupert until the wee hours of the morning? Too long! Want to learn how mom cans your favorite salsa or pear preserves? Need to get basic instructions of how dad builds those windmills for the yard, which he has given to everyone in town? Need to help them clear the clutter, gutter, or garage? Many times, our elder loved ones will appreciate the ability to share their wisdom. Others may appreciate the help to get a chore done. Many times, age and medical conditions can cause them to not be able to accomplish things as they once could. Tomatoes, potatoes, and lettuce can easily be grown in large containers on the patio. Help your parents (or grandparents) to establish this food source “hobby” that will remind them of you long after your visit. Many things that are commonplace for us, and our children, are completely unknown to our older loved ones. Let the grandkids have an active role in the education process — it will bring the two generations closer together! Plus, it generates another means of communication between you and them. After the holidays, we return to our routine. It is easy to slip back into the “daily grind” and to relapse into the previous “day-to-day way of life.” Make a concerted effort to keep sharing your time with your loved ones. Plan the NEXT visit — Stay Connected! 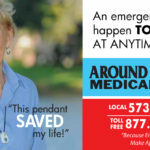 If you notice changes in your loved one and they are now “alarm appropriate,” let us Help! 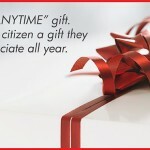 Great ANYTIME Gift Idea! Help. Any Time. Any Day. Any Reason.